Sometimes something simple is the order of the day – a dish that is light, tasty and ready to eat with a bare minimum of fuss. 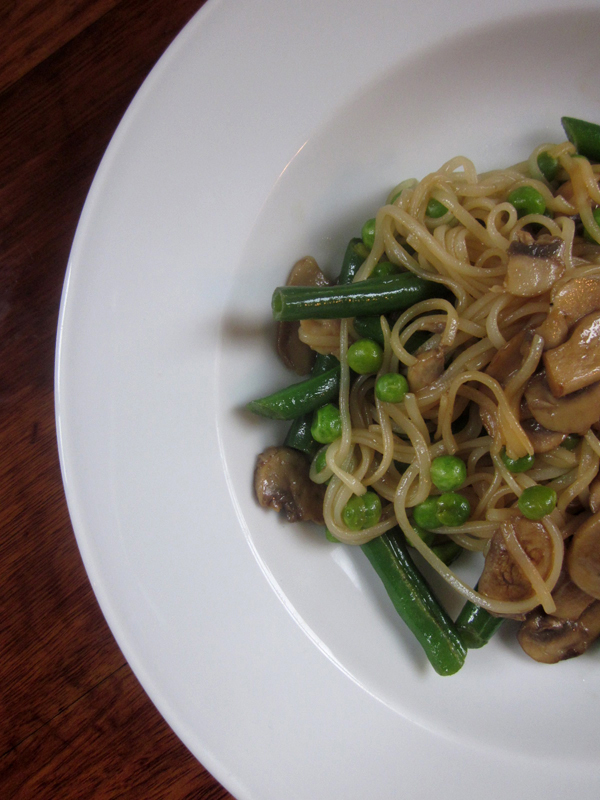 These yummy noodles fit the bill perfectly. They are ready to eat in fifteen fast minutes and are flavoured with a deliciously easy dressing made from sesame oil and soy sauce with a dash of rice wine vinegar. This is a great, quick small meal or solo snack. Healthier than a packet of two-minute Mi Goreng and so, so much more satisfying. The recipe scales up easily, so if you are feeding more than just yourself, multiply all ingredients 1:1 and you will have a room full of happy bellies in no time flat! Feel free to substitute whatever vegetables you have lying around for the ones suggested here; carrot sticks, broccoli florets, cauliflower and courgette slices are all great options. Cook beans in boiling water for a minute or two, then drain and set aside. In a medium saucepan, cook rice noodles according to packet instructions. While noodles are cooking, add rice bran oil to a medium-hot wok (or frying pan). Add mushrooms and cook for 1 minute. Add beans, peas and a splash of soy sauce. Cook 1-2 minutes, until mushrooms are cooked through, stirring regularly. Cover and set aside. When noodles are cooked, drain well, then briefly rinse under cold water. 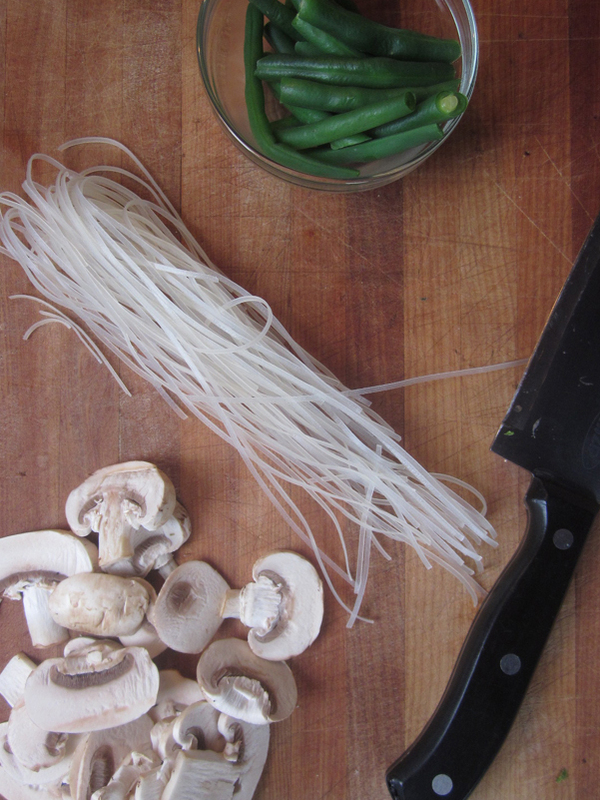 Shake off any excess water and add noodles to wok. Add soy sauce, sesame oil and rice wine vinegar. Mix gently with a fork until noodles are well combined with vegetables and sauce, and mixture is heated through. Add a little more soy sauce if desired. Serve immediately.